Recently Supreme court of India has declared that forcing people to link their aadhaar card in bank account or any other account unconstitutional. Those who have not yet linked their aadhaar card should be happy about this verdict. However, what if you have already linked your aadhaar number with your bank account? Should you need to delink or let it be there to be linked? The answer is yes and no. It depends. That is, if you have direct benefit transfer (DBT) in your bank account, then the answer is NO, it is mandatory for receiving subsidy from Government. Otherwise, the answer is YES and go ahead to delink at any time. So you should contact your bank manager to delink your aadhaar number from your bank account. Probably, the bank manager will ask you to submit a request letter to start processing the delink. Here we have given a sample format to write on! Read on to know the model / sample letter format. 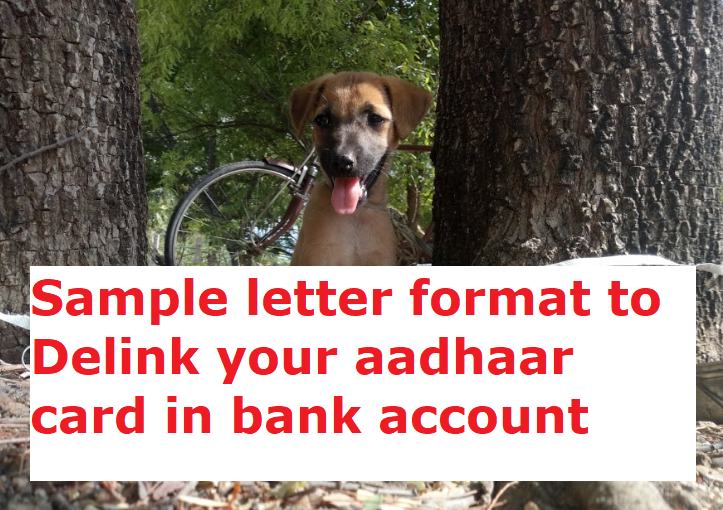 This letter format will help those who have linked aadhaar with mobile number / linked aadhaar with credit card etc. As you know I am one of your customer since 2010. I have already linked my aadhaar number 7345 6578 7654 to my account number 675438765. As per the supreme court order, I came to know that linking the aadhaar number with bank account is not mandatory. So I don't want my aadhaar to be linked with bank account anymore. I have no direct benefit transfer (DBT) for this account number. Hence I kindly request you to process my request and delink my aadhaar number from my bank account number. I have also attached my KYC documents (Copy of PAN card, copy of address proof, copy of bank passbook) for your reference. Note to visitors: The sample format given above is for only reference. You need to give your own details in the places wherever applicable. 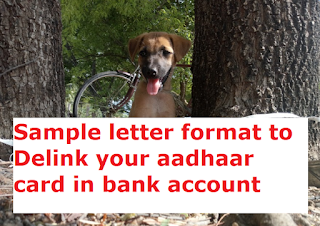 Thanks for reading Sample letter format to delink your aadhaar card in bank account. Keep sharing this article among your friends and relations.